Purple Runt Chicken: Like many I see, I am new to raising chickens and am coming to you for help. I have had 2 die this week and have questions about two others. I'll answer your questions in order. 3. List all symptoms: We have had two die this week. I don't know why. I didn't see any bite marks (other picking or rodents). But my concern now is for "chicken little". It (she/he) is only the size of a softball, and the others are at least double its size. It also has dark purple under the (few) feathers it has. When I pick it up it is very tame, and when I put it back down it just stands there. Not very active compared to the others in the flock. The other one of concern we call "Gimpy". It has 1 leg that lays flat out its side. I've read on your site about splinting its leg, but it is on the elbow so I don't know how that will work. 4. Is it a hen or rooster: It won't tell me :-> I'm not sure how to tell. 5. How long has the bird had these symptoms: It's always been small, but the purple has been noticeable for about 2 weeks. 6. What type of feed are you using: Nutrena Nature Wise Chick Starter Grower. 7. Types of medications: None, we are trying to do this as natural/organic as we can. 8. 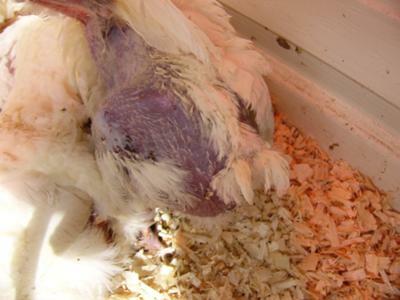 How many chickens are in the flock: There was 17, but 2 have unexplainable deaths. 9. Have new chickens been introduced recently: No, we got them all the same day. 10. 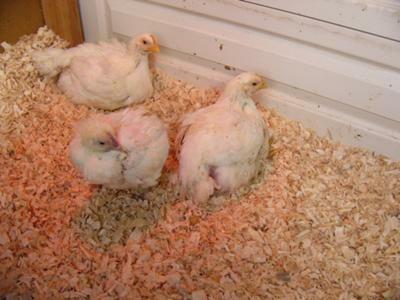 Free range or kept in pen: I converted 1/3 of my shed into a coop with the water/food/heat lamp, and use shredded pine (also from Cal Ranch) as flooring. The coop has a door to the outside run which is all grass. Here in Idaho it is still in the 30/40's at night. 11. Include pictures if possible: Okay. I guess my main concern is that many of these chickens have bald rears, however, Chicken Little's is purple. Her (if she's a her) whole body is purple and she is just tiny. With Gimpy, her elbow is swollen/hard but bends outward. She gets around to the food and water, so I haven't "put her out of her misery" yet. I'm not sure if I can splint her leg or not, or if she'll make it to butchering day. The pen did get a bit messy for a couple days, but I have gotten it all cleaned up now. I think you are finding out what it's like raising Cornish Cross. 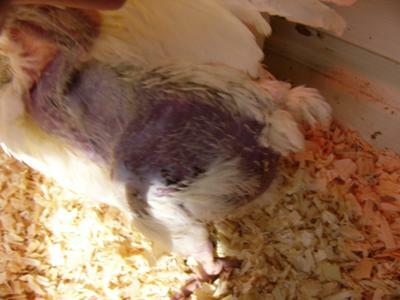 Chicken skin exposed to light often turns reddish in color, but the purple could be a sign this chick's oxygen levels are low. This breed is mass produced for butchering, often with little concern for their short unnatural lives. In commercial settings they are often fed antibiotics to help ward off diseases. They have been genetically programmed to grow at such a pace, that often their legs can't keep up with the demands of a constantly increasing body weight. In any group of chicks you have your strongest and weakest. 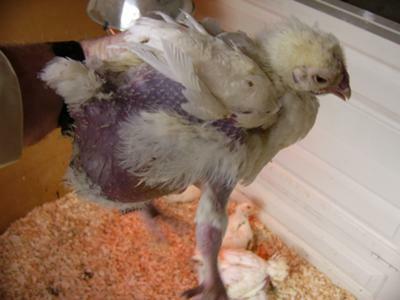 The strong can make the weak look awfully pathetic and actually, due to the competitive nature of chickens, often the strong have been picking on the weak and making their lives difficult. It sounds like you have a good set up. I would suggest avoiding corn as this tends to just add to the fat and fluid percentage of their body weight. Good protein balance, with all nutrients, will give you healthier and leaner chicks and meat. There is a reason corn is a cheap filler for much animal feed; there is little nutritional value and it's been the trick of feeding animals for market to max out body weight for more $$ (without much regard for sustainable well being). Offering vitamins and minerals can help with healthy immune systems. Feeding a good grower feed and adding whole seeds and nutritional grains, fruits and veggies is probably going to give you healthier chicks.